There isn’t much you can append ‘Blood’ with to make everything seem a-okay. Blood and Sand is a combination that can only lead to infection, and 2009 straight-to-DVD martial arts movie Blood and Bone looks pretty scary too. On the other hand, the NHS Blood and Transplant authority do good work, and Blood and Fire only reissue quality reggae, which seems relatively harmless. Blood and Madness, though: that’s an unambiguously bad c-c-combo. Observe. Now I’m wondering just how cool it’d be to descend into Guild Wars’ dungeons in first-person. And in French. Le sang et la folie. Just as Tom Jones can’t be persuaded to leave Vegas, the Mad King is mad fond of his regular Halloween performance in Tyria. This time he’s bringing his son, the Bloody Prince, who’ll contribute his own flavour of “frightful” challenges. This year’s best-sounding new event in the Lunatic Inquisition, which sees players don the guise of either a doomed villager or axe-happy courtier in a PvP survive-the-night affair. Elsewhere there’s trick-or-treat at haunted doors throughout Tyria, the undead armies of the Bloody Prince’s labyrinth, and Guild Wars’ “most maddening” timed jumping puzzle yet – the Mad King’s clock tower. For more on this year’s unique rewards and meta-achievements, see our original post on the Guild Wars 2 Halloween update. Or wait till tomorrow, when it’ll all be live (apart from the zombies, natch, who’ll stay resolutely dead). 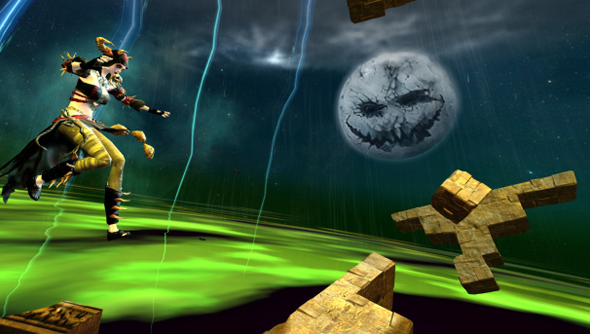 What’s been your favourite bit of Guild Wars Halloween celebrations past?